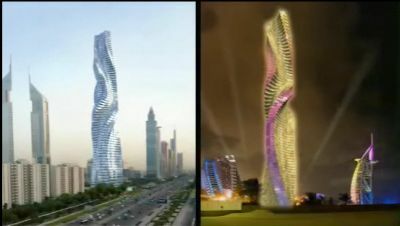 The Dynamic tower, the first building in motion, takes the concept of green buildings to the next level where it will generate electricity for itself as well as other nearby buildings, making it the first sky-scraper designed to be self-powered. The building generates electricity from wind turbines mounted horizontally on each floor, this eighty storey building will have seventy nine wind turbines, making it a true green power plant. 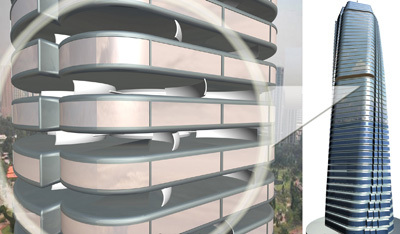 Another environmentally green element of the Dynamic Tower is the photovoltaic cells that will be placed on the roof of each rotating floor to produce solar energy. About 20% of the roof will be exposed to sun, so the building that has 80 roofs will equal the roofing space of 10 similar size buildings. In addition, natural and recyclable materials including stone, marble, glass and wood are intended for the interior finishing. Further improving the energy efficiency of the Dynamic Tower, insulated glass and structural insulating panels are employed. During construction, energy use is drastically reduced due the pre-fabrication of the buildings in a factory, versus traditional construction methods, which results in a cleaner construction site with limited noise, dust, fumes and waste. Actually, this is just another crazy idea that cannot be realized. Lets wait and watch if this is really possible.. This entry was posted by Benzu JK on February 28, 2010, 4:09 pm and is filed under Sustainable Design. You can follow any responses to this entry through RSS 2.0. BEST EXAMPLE OF MODERN ARCHITECTURE. IT’S A HIGH TECN. SYSTEM IS USE. Green buildings save money, starting the very first day of construction. This is true for green homes as well as sustainable office buildings, factories, churches, schools and other structures.